BENSON - Looking for a little variety in your entertainment options? 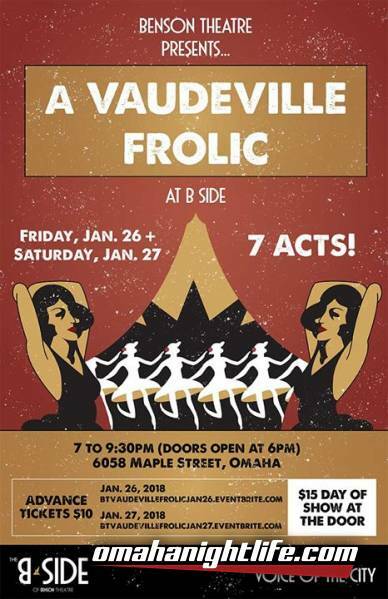 Benson Theatre is pleased to present A Vaudeville Frolic at B Side - the first in its series of monthly vaudeville showcases - Friday and Saturday, Jan. 26-27, at 7:00pm at The B Side of Benson Theatre, 6058 Maple Street. Tickets are $10 in advance or $15 day of show at the door. All proceeds benefit the theater's capital campaign. 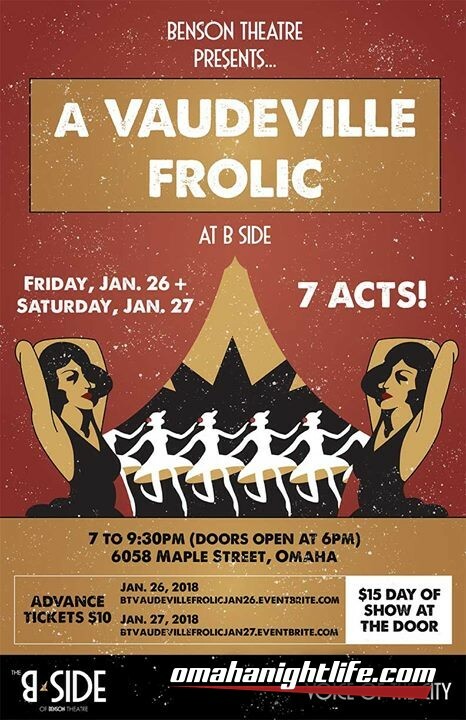 "Back in the day, a typical vaudeville performance was made up of a series of separate, unrelated acts grouped together on a common bill," said Benson Theatre Executive Director Amy Ryan. "Our goal is to use this format to introduce new audiences to a diversity of local talent while raising funds for the renovation of our future home at 6054 Maple Street." Aly Peeler will emcee the January showcase, which will include performances by Travis Newcombe (magic), Michelle Troxclair (spoken word), Derek Kordash (martial arts), Dolce Vita and the Omaha Snake, Suzy Fendrick (ballet) and Big Canvas (comedy/improv). The evenings also will include a brief presentation from Ryan on Benson Theatre's restoration efforts. The entertainment lineup is the same both nights, Ryan said, and includes an intermission. The B Side bar will be open for business. Support for Benson Theatre's monthly vaudeville showcases is made possible in part by the Douglas County Visitors Improvement Fund. For more information about Benson Theatre, visit www.bensontheatre.org.